MCLAREN’s glaring error in not having a fuel sample to show to the FIA has seen Lewis Hamilton be stripped of his hard-fought pole position during an intriguing qualifying session for tomorrow’s Spanish Grand Prix. This means that Pastor Maldonado will start the race from an unlikely and sensational pole. Maldonado becomes the first Veneuzeulan driver to start a Grand Prix from the front and is the perfect present for Sir Frank Williams, celebrating his 70th birthday. It is the team’s first dry pole position since Nick Heidfeld at the European Grand Prix on Germany’s Nurburgring in 2005. Fernando Alonso produced another special performance to put his Ferrari on the front row for his home race. Throughout qualifying, Hamilton seemed to be the only driver who was consistently at the front as many of his closest and more predominant challengers fell by the wayside. Team-mate Jenson Button complained all day about hapless amounts of oversteer and when the team made changes to the front end of the car for his final Q2 run, understeer crippled his chances. Button vented his frustration on the team radio afterwards; “The car has too much understeer now, work that one out guys!” With a face like thunder, he has to accept tenth on the grid following Hamilton’s demotion. Another big casualty in Q2 was Mark Webber. The Australian is battling the effects of a heavy cold this weekend and Red Bull were caught out by a solid first run which saw Webber initially in second place on a 1.22.977. He sat in the garage as the track made significant gains and dropped out of the top ten for the first time since China last year. Felipe Massa also made his now customary exit from Q2 and was the slowest driver in the session, fighting his Ferrari furiously, it looked like a car that was akin to a golfer having little control on his swing and ending up in a predictable bunker! Maldonado had looked quick in the final practice session before qualifying and was consistently fast throughout the session, looking to improve on a career best of 8th place from previous attempts. 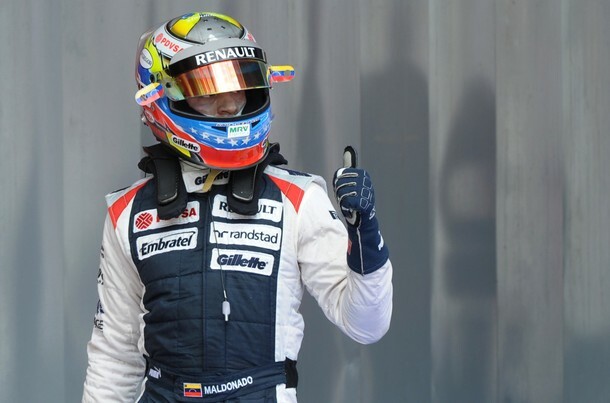 His team-mate Bruno Senna looked all at sea and chucked his Williams into the gravel after looking down at his lap delta, misjudging turn 11 and spinning off backwards at the end of Q1. To see Senna down in 17th with his team-mate on pole will make him feel as sick as a parrot. Narain Karthikeyan failed to make the 107 per cent cut-off time but has been given special dispensation to race due to a number of technical issues that have hindered his weekend. There were also solid efforts from Charles Pic and Vitaly Petrov to outqualify their team-mates at Marussia and Caterham, Timo Glock and Heikki Kovalainen respectively. The final part of qualifying was a slow burner, with several runners including world champion Sebastian Vettel and Michael Schumacher running system checks rather than go for pole position. Neither set a competitive lap time and consequently start 8th and 9th. A technical problem at the end of Q2 left Kamui Kobayashi stuck out on track and the Japanese driver couldn’t run in Q3. Sergio Perez underlined Sauber’s strong pace to set the sixth fastest time, quicker than Chinese Grand Prix winner Nico Rosberg. Romain Grosjean bounced back from a fuel pressure problem this morning which limited his running to continue his impressive return to the sport. Grosjean will begin third, one place ahead of Kimi Raikkonen as Lotus lockout the second row and with formidable race pace from Friday’s simulations, could be in the driving seat for tomorrow. As ever, Alonso got the absolute maximum out of his car and a front row start is a miraculous effort. Maldonado’s lap was marvellous and considering his strong pace all weekend, maybe not so much of a surprise after all. Hamilton was in a class of one, so its a shame that his team decided to let him down again. Fireworks, drama and tactics are sure to be part of the elements tomorrow at the Spanish Grand Prix, don’t miss it! Posted on May 12, 2012, in Qualifying Reports and tagged bruno senna, F1, Ferrari, Lewis Hamilton, Lotus, mark webber, McLaren, narain karthikeyan, pastor maldonado, Spain. Bookmark the permalink. Leave a comment.